Looking for SoCal life but want something different than the LA sprawl and San Diego’s high rental prices? Long Beach might just be your answer. It may be one of the last inexpensive (relatively speaking) beach towns in SoCal. Get it before it’s gone. Long Beach is home to several schools that appeal to different audiences of students. Most prestigious would be Cal State Long Beach which is centered between the neighborhoods of Bixby Hill and the Park Estates. There’s little student housing for students past their freshmen year, so you’ll find most students living in houses for rent and apartments in each of these nearby neighborhoods with the addition of Circle Area. For students trying to find inexpensive apartments for rent: the further away from the beach you are, the better your options are. It’s the sad, but honest truth. Also, using an apartment finder over Craigslist is a great way to bypass scams and unreliable apartment listings. Meanwhile, if attending a four year isn’t your thing or you plan to transfer, DeVry University and the City College of Long Beach are right in town. Students that have any questions with the renting process should check out RentLingo’s Apartment Resources page. The tempo of life here is hard to disappoint anyone that likes to have fun. There’s the Bayou Festival where you can dine on Cajun and Creole cuisine and listen to live Louisiana and New Orleans blues music. There’s also the local Pride Festival which takes place every year in May and is considered one of the best Prides in the state. Or live music during summer weekends at Shoreline Village’s boardwalk. Long Beach has its own Grand Prix, its own aquarium, and two dog parades each year during Easter and Halloween. There’s even a Dragon Boat Race, so there’s basically something for everyone. Obviously, you are going to spend time at the beach. Which one though? There’s Alamitos if you want to be within walking distance to downtown and able to cruise along the beachfront bike path. Bluff Park if you want enjoy a picnic while watching the sunset on its soft, grassy lawns. There’s Rosie’s Dog Beach for anyone looking for a pet-friendly beach to let their pup run wild on the sand. And of course, Belmont Pier Beach if you want are looking for a place to watch Fourth of July fireworks while above the ocean. 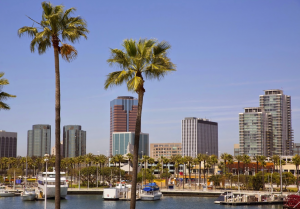 If you want to be amidst Long Beach’s energy, there’s no better place than living in Downtown. The apartment search within downtown will yield some of the best apartments for rent in Long Beach. Chances are you’ll be sitting high and mighty in a high-rise apartment overlooking the ocean in a luxury apartment, loft or condo. Though, finding these apartments will be best done with an apartment guide, since the highest rated and reviewed apartments do not need to be posted on Craigslist. Although it might be a bit pricey, Long Beach is on the road of redevelopment and the first place it’s showing is within downtown. As far as shopping goes, you can pretty much find anything at places like Long Beach CityPlace, or areas like 4th street and the many restaurants and boutiques off of East Broadway and the Promenade. East Village deserves a special mention. Located just southeast of downtown, this neighborhood also boasts fun nightlife like, tasty restaurants, and a bazillion different independent and locally-owned shops. East Village is considered one of the best areas of Long Beach for singles. There’s a variety of housing options from apartments to homes for rent, as well. Couple that with it home to arts district of Long Beach (you have to check out the Museum of Latino American Arts and the Second Saturday Art Walk) and suddenly you may have found one of the best neighborhoods to live in. If you need to find more inexpensive options like cheap apartments with all bills paid or studio apartments with all utilities included, looking north and northeast of East Village will better suit you while giving you great proximity to the beach and fun of downtown. RentLingo is your trusted apartment finder in Long Beach. We hire local experts, such as former property managers and locators to anonymously tour and consistently rate and review every available place. They share their honest and unbiased perspective with you, so you know how every rental ranks in the area. Because our experts tour every property, we can offer consistent apartment ratings across every region. So unlike finding a Backpage or Craigslist rental, you can trust these apartments are verified and trustworthy: whether it's a cheap studio or a one bedroom with all utilities paid all the way up to a nice house for rent or a luxury condo.